428 pages | 121 B/W Illus. In the context of great economic turmoil and uncertainty, the emergent conflict between continued globalisation and growing economic nationalism means that a geographical economic perspective has never been so important. An Introduction to Economic Geography guides students through the key debates of this vibrant area, exploring the range of ideas and approaches that invigorate the wider discipline. This third edition includes new chapters on finance, cities and the digital economy, consumption and the environment. Underpinned by the themes of globalisation, uneven development and place, the text conveys the diversity of contemporary economic geography and explores the social and spatial effects of global economic restructuring. It combines a critical geographical perspective on the changing economic landscape with an appreciation of contemporary themes such as neoliberalism, financialisation, innovation and the growth of new technologies. 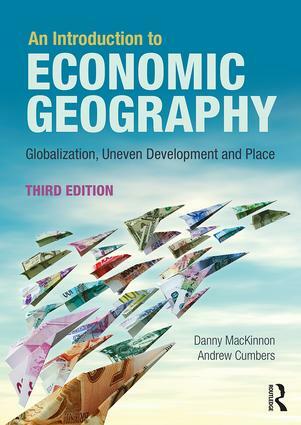 An Introduction to Economic Geography is an essential textbook for undergraduate students taking courses in Economic Geography, Globalisation Studies and more broadly in Human Geography. It will also be of much interest to those in Planning, Business and Management Studies and Economics. Danny MacKinnon is Professor of Regional Development and Governance and Director of the Centre for Urban and Regional Development Studies (CURDS) at Newcastle University, UK. Andrew Cumbers is Professor in Regional Political Economy at University of Glasgow, UK.